All the news they don't want you to know about. Following events in Cuba and Venezuela with access to primary sources then reading about it in the mainstream press is a sometimes sobering affair. For example, in Venezuela on April 25, 2014 the rubber stamp Supreme Tribunal of Justice outlawed spontaneous peaceful protests in Venezuela in violation of international human rights standards. 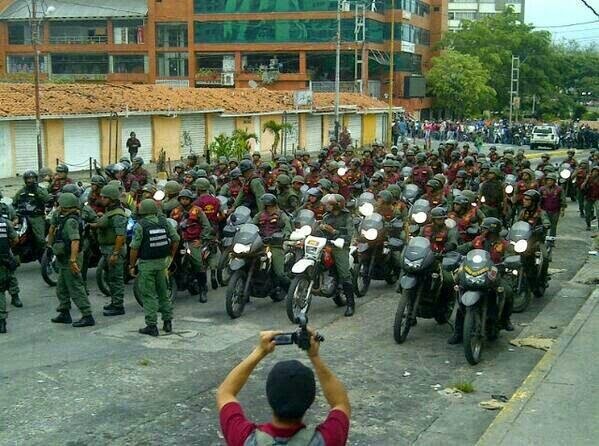 The Venezuelan military has mobilized troops and maintained a visible presence in areas where the populace are anti-regime. 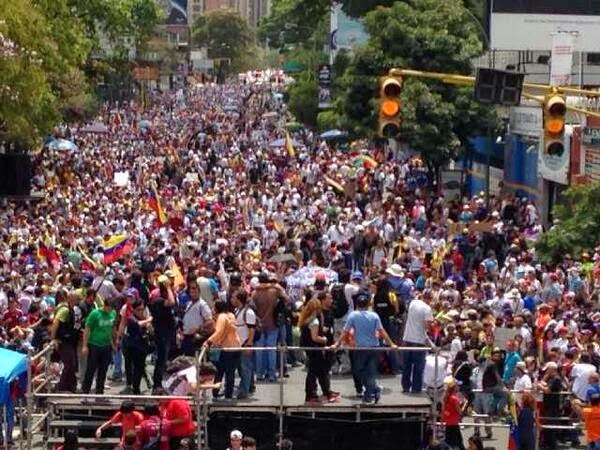 Finally today thousands of Venezuelans took to the streets in mass demonstrations against the political indoctrination of their children. You wouldn't know this from the mainstream media.The question to mainstream journalists is not all of this news? The negative news about the broadcast, cable and print news has been a steady drumbeat for many years. However, news professionals before putting the blame on consumers, technology or other factors may want to take a closer look into how they are reporting and what they are producing in the way of news. The perception is that the quality of news reporting has declined and cable programs such as The Daily Show and The Colbert Report have had a lot of material to mine in ridiculing what goes on in the mainstream media and demonstrating its increasing irrelevance. Promised in an earlier blog entry to explain how one can successfully confront violent regimes and unjust and exploitative systems with deep structural violence. At the time gave the CliffsNotes answer: With nonviolence, love and a coherent strategic vision that involves a constructive program as well as creative nonviolent resistance. This is not to be confused with passive resistance or being passive aggressive. 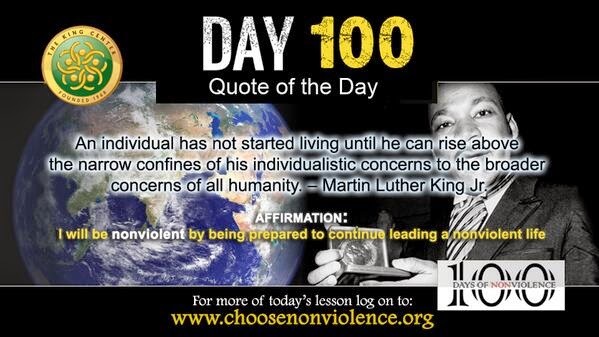 Today is the perfect day to begin to enter more concretely into this subject matter for a number of reasons: 1) Today marked the 100th day of the King Center's 100 Days of Nonviolence. 2) Today marks the official observance of the Armenian Genocide. 3) Just finished reading Michael N. Nagler's The Nonviolence Handbook: A Guide for Practical Action 4) In Venezuela saw that medical students were engaged in a combination of civil disobedience and a constructive program that bears closer examination. 1. We approach out situation with right intention. We are not and do not need to be against the well-being of any person. "If what we do for Cuba, we do not do for love, better not do it. If all of us who want the good of the nation, of the important internal dissident movement and the persevering of exile arm ourselves with these virtues, we will be effective. If we are committed to not let personalism, or the passions dilute them, we will have won. If we keep them and transmit them to all our people, we will have secured for Cuba a happy future. " More concretely, I would say that the greatest importance of the internal dissident movement in Cuba today, is that it has proven that political action can be consistent with what conscience knows and that is that the force of reason is, and should be more powerful than the reason of force. "I do not believe that means can be separated from ends.The means that you use to achieve your ends will in the end color those very ends themselves. If we are to march along the road to freedom full of hatred and full of the instincts of violence what we find at the end of the road will not be freedom but another kind of prison. A prison that we have constructed for ourselves through our own feelings of hatred and violence." What satyagraha does in these cases is not to suppress reason but to free it from inertia, and to establish its sovereignty over prejudice, hatred, and other baser passions. In other words, if one may paradoxically put it, it does not enslave, it compels reason to be free." What he calls "reason" here is better described as the innate awareness that we are all connected and that nonviolence is "the law of our species." 1. Avoid the major networks and media outlets. 3.Take up a spiritual practice. 4. Be more personal with others. 5. Find a project and get active. For Cubans reading this blog entry on nonviolence who remain skeptical please answer the following question: "How many more national saviors using violent means to dislodge a despotic regime only to become a worse version than his predecessor? Violently overthrowing Spanish imperialism with the help of the United States ended with Independence war hero General Gerardo Machado becoming Cuba's first dictator who was then violently overthrown by a coalition of students and soldiers turning Fulgencio Batista into a national figure and next dictator who was then violently overthrown by Fidel Castro who then set up a totalitarian dictatorship that endures to the present day. Isn't it time to stick with nonviolence and try a different approach?" Cuba's democratic period that lasted between 1940 and 1952 was the product of a dialogue and negotiation between all political tendencies that although imperfect was the best period in Cuba's republican history between 1902 and the present. Unfortunately the regime now in power has proven that it will not change through a process of conflict resolution but that only means that creative nonviolent resistance combined with a constructive program can achieve lasting change on the island. 102. Based on the criteria spelled out by the IACHR in 1997 to identify those states whose human rights practices merit special attention, the Commission has considered that the human rights situation in Cuba fits within the first and fifth criteria, insofar as the political rights enshrined in the American Declaration of the Rights and Duties of Man are not observed, and structural situations persist that have a serious and grave impact on the enjoyment and observance of fundamental rights enshrined in the American Declaration. 103. Having evaluated the human rights situation in Cuba, the IACHR decided to include that country in this chapter because, in its view, it meets the criterion under Article 59, paragraph 6(a)(i) of the IACHR’s new Rules of Procedure, which took effect on August 1, 2013. That provision concerns “a serious breach of the core requirements of representative democracy mentioned in the Inter-American Democratic Charter, which are essential means of achieving human rights, including: “there is discriminatory access to or abusive exercise of power that undermines or denies the rule of law, such as systematic infringement of the independence of the judiciary or lack of subordination of State institutions to the legally constituted civilian authority”. Also, it meets the criterion under Article 59, paragraph 6(c) which refers to “The State has committed or is committing massive, serious and widespread violations of human rights guaranteed in the American Declaration, the American Convention, or the other applicable human rights instrument”. Accordingly, the IACHR will recount the activities carried in 2013 with reference to Cuba, analyze the human rights situation in that country, identify best government practices and make recommendations. 104. The restrictions on the political rights to association, freedom of expression, and dissemination of ideas, the lack of elections, the lack of an independent judiciary, and the restrictions on freedom of movement over decades have come to shape a permanent and systematic situation of violation of the human rights of the inhabitants of Cuba. In the course of 2012, the information available suggests that the general human rights situation has not changed. The above-indicated human rights situations, as well as severe repression and restrictions of human rights defenders persist. Also, the IACHR received information on violence and discrimination against LGTBI persons in Cuba. 105. In preparing this report, the Commission has obtained information from international agencies, civil society organizations, and the Cuban government via the official web site of the Ministry of Foreign Affairs of Cuba. The Commission notes the scarcity of information available on human rights in Cuba from sources both on the island or abroad. 106. On November 19, 2013, the Commission sent this report to the State of Cuba and asked for its observations. The State did not respond. Full report available online here in English and in Spanish. 138. In 2013, the level of physical assaults, threats, harassment, and acts of repudiation against human rights defenders in Cuba was maintained, particularly those involved in the defense of the rights of persons who have been deprived of liberty for political reasons. According to Amnesty International, the Cuban Government does not recognize monitoring and protection of human rights has a legitimate activity, nor does it grant legal status to local human rights organizations.105 As noted, the repression of human rights defenders in Cuba takes the form of physical assaults and detentions for short periods of time, ranging from a few hours to several days. 141. The Commission wishes to underscore the importance of the work of human rights defenders in the region. It has consistently highlighted the importance of the work done by persons dedicated to promoting, monitoring and legally defending human rights and the organizations with which many of them are affiliated. The Commission therefore considers that the acts of violence and other attacks committed against human rights defenders not only violate the guarantees that attend every human being, but also attack the pivotal role that human rights defenders play in society and leave all those whom they strive to protect defenseless. 142. The Commission received information alleging that the State was systematically expelling human rights defenders and members of their families from universities and refusing to admit them to university-level education programs. The IACHR is compelled to reiterate that education is a human right and an essential enabler of the enjoyment of other rights. 143. The IACHR was also informed of an alleged practice on the part of the State whereby health clinics refuse to treat persons involved in the work of defending human rights, even in those cases where the condition of the human rights defender is extremely serious.107 The IACHR recalls that the right of every person, without discrimination, to physical, mental and moral integrity is protected under the American Convention on Human Rights. The right to personal integrity in the area of health is closely related to the right to health, since adequate and timely health services are one of the principal means of guaranteeing the right to personal integrity. 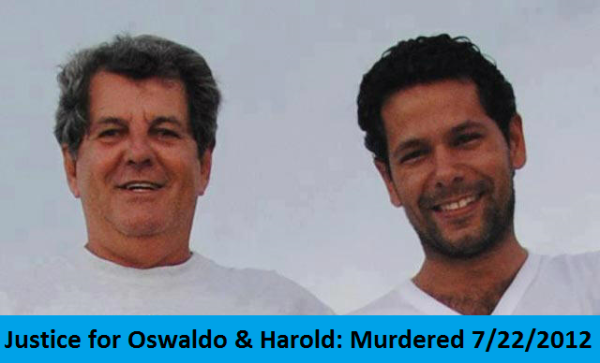 640 days ago civic nonviolent leaders Oswaldo Payá Sardiñas and Harold Cepero were killed under extremely suspicious circumstances on July 22, 2012 in Cuba. Both men had led lives of nonviolent resistance to injustice. 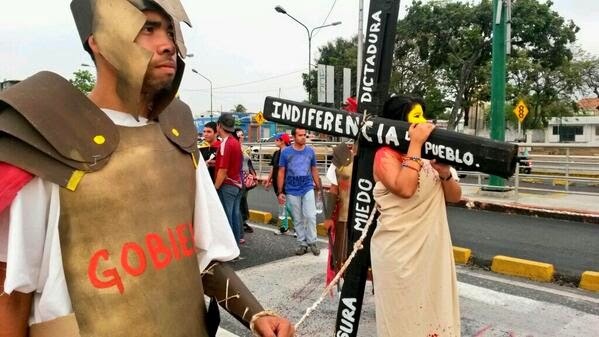 60 days ago in Venezuela, Geraldine Moreno died from her injuries on February 22, 2014. She was 23 years old. She was shot in the head with buckshot on February 19, 2014. Today learned about, Orlando Lorenzo de Jesús Castellano Olivo. 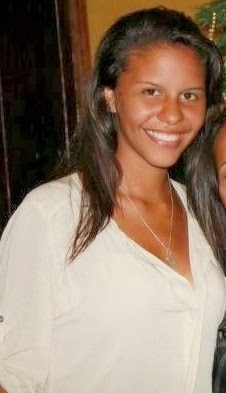 the latest Venezuelan youth to be shot in the head and killed. 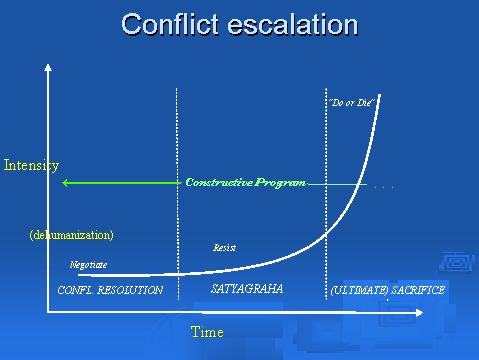 "Conflicts escalate when they are not resolved, and if they are left untended they can rapidly get out of control." From the nonviolence point of view, the intensity of a conflict is not necessarily a question of how many guns or how many people are involved (the same metric would work for a quarrel between lovers as between nations); it is primarily about how far dehumanization has proceeded. If someone no longer listens to you, is calling you names or is labeling you, it’s probably too late for petitions. In terms of knowing how to respond, we can conveniently think of this escalation in three stages that call for distinct sets of responses. Let’s call these three stages Conflict Resolution, Satyagraha (active nonviolent resistance), and—hopefully this is rare, but it helps to know it exists—Ultimate Sacrifice (see Figure)." In both countries the regimes in power call those who oppose them: worms, and fascists. Presently sectors of the political opposition in Venezuela have sat down to dialogue with a government whose leadership rejects the legitimacy of the opposition but uses the process for tactical purposes to slow the imposition of international sanctions for their systematic human rights violations. In Cuba, the opposition is not only not recognized but also illegal. Unfortunately, the time for conflict resolution in both countries has long passed and in the case of Venezuela the democratic resistance is engaged in Satyagraha via mass demonstrations and many young people are also risking their lives continuing to march and protest the abuses and failures of the Maduro regime. In Cuba there has been a nonviolent opposition that for decades has engaged in projects and campaigns: both constructive and resisting the regime paying a high price and risking all. These oppressive regimes thrive on violence and hatred and seek to provoke it in both their supporters and opponents in a spiral of dehumanization that entrenches an unjust and exploitative system with deep structural violence. How to confront it? With nonviolence, love and a coherent strategic vision that involves a constructive program as well as creative nonviolent resistance. More on that in a later entry. In the mean time people of good will can take two concrete actions. The families of Oswaldo Payá Sardiñas and Harold Cepero are seeking an international investigation into their deaths to arrive at the truth of what happened and are gathering signatures in support of this. Signers thus far include the South African Nobel Laureate Archbishop Desmond Tutu. Amnesty International has a signature campaign underway calling on the Venezuelan government to investigate human rights abuses and prevent further human rights violations in the context of the ongoing protests. The dictatorship in Cuba has been in power for 55 years. 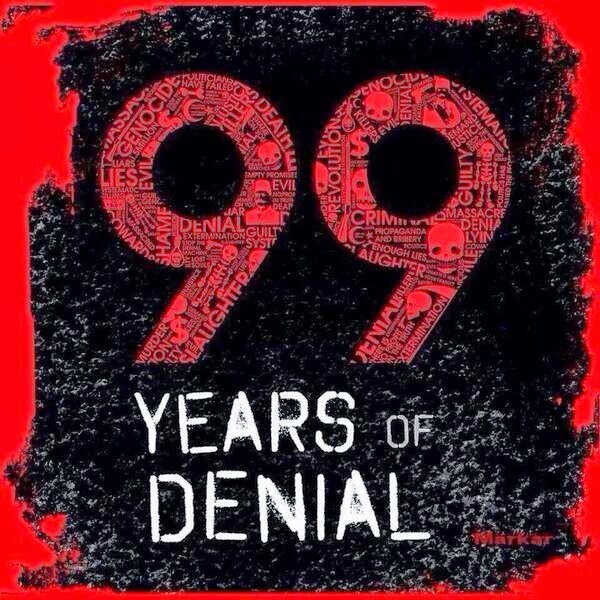 Despite being an island just 90 miles south of the United States it has projected itself internationally to undermine democratic and international human rights standards over that time working through international institutions such as the UN Human Rights Council. In the 1960s the Castro regime organized meetings in Havana, Cuba gathering guerrillas and terrorists from around the world with a common aim to destabilize governments by means of armed struggle and terrorism was viewed as a legitimate tactic. They were called gatherings of the Tricontinental. At the height of the October 1962 Cuban Missile Crisis, Fidel Castro personally recruited former Nazi SS Waffen members to train Cuban troops and he also reached out to Nazi operatives, Otto Ernst Remer and Ernst-Wilhelm Springer, in Germany's extreme right to purchase weapons. 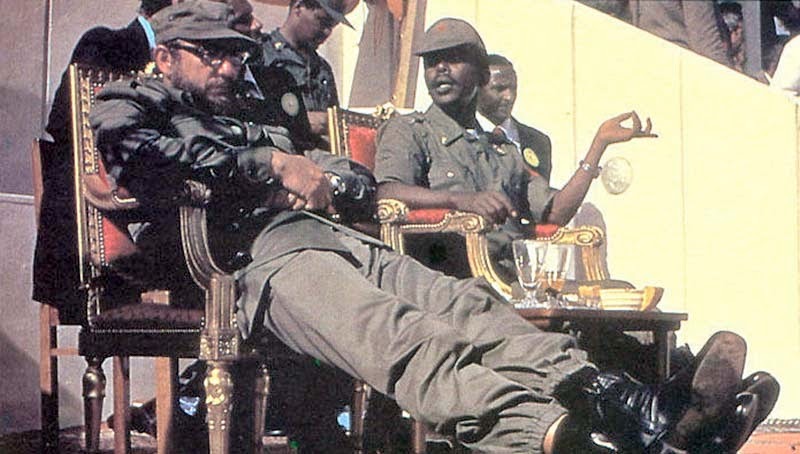 Many focus on the Castro regime’s involvement in Angola in the 1970s backing a Marxist regime in battles against anti-communist guerrillas and the South African regime but fail to mention another important incursion in Africa. In Ethiopia the Castro regime backed Mengistu Haile Mariam with advice, troops and high level visits by both Fidel and Raul Castro. War crimes such as a provoked famine and the targeting of ideologically suspect children for mass killings led to downplaying the role of the Castro regime in the whole affair. 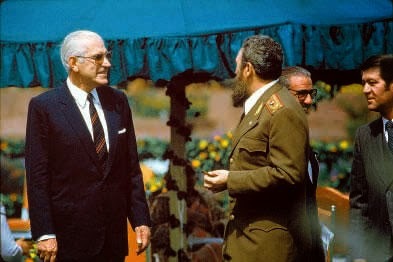 In the 1970s in addition to supporting guerrillas and terrorists the Castro regime also began an unusual relationship with the military dictatorship in Argentina helping to block efforts to condemn it at the United Nations Human Rights Commission for thousands of leftists disappeared by the regime. Reynaldo Benito Antonio Bignone Ramayón, brutal military dictator of Argentina between 1982 and 1983 (in the picture above with Fidel Castro). 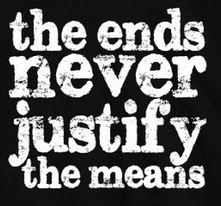 On April 20, 2010, the Argentine despot was sentenced to 25 years in prison for the kidnapping, torture, and murder of 56 people in a concentration camp. In 1979 the Castro regime found success with the ouster of the Somoza regime and the entrance of Daniel Ortega and the Sandinistas into Nicaragua. In the early 1980s Cubans had made inroads into Grenada in the Caribbean. By the late 1980s with the collapse of their main subsidizer, the Soviet Union, and the Warsaw Pact the Castro regime was temporarily on the defensive. For the first time since 1959 they felt forced to allow the International Red Cross to visit prisons, allowed Human Rights Watch and Amnesty International to enter Cuba in a formal visit as well as the United Nations Human Rights Commission. 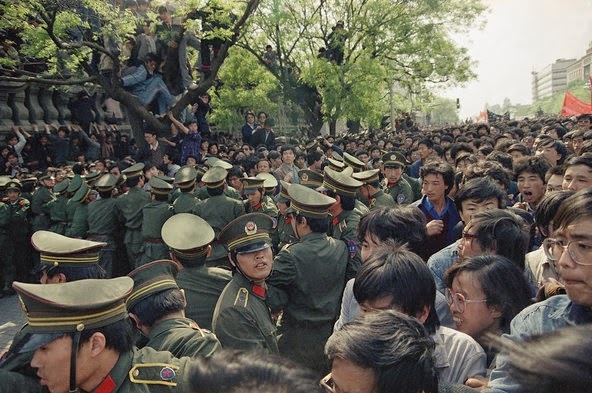 The Castro regime had been one of the few voices applauding the 1989 Tiananmen Square Massacre in China congratulating them for "defeating the counterrevolutionary acts.". These trends would change dramatically by the end of the 1990s with the warming relations with Mainland China throughout the 1990s and the arrival of Hugo Chavez to power in Venezuela in 1999. 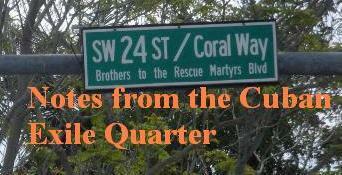 For sake of brevity will highlight here some of the outrages perpetrated by the Castro regime within the United Nations Human Rights Council. On June 1, 2012 at a Special Session on the deteriorating human rights situation in Syria with a special focus on the massacre in El-Houleh the Cuban regime and its allies took a stand against holding the Assad regime accountable for its gross and systematic human rights abuses. 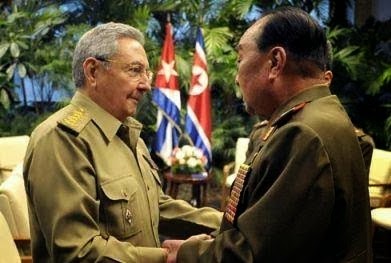 On July 15, 2013: “Panama captured North Korean-flagged ship from Cuba with undeclared military cargo.” On March 6, 2014 the United Nations released a report indicating that the Castro regime was in violation of international sanctions placed on North Korea and had not cooperated with the investigation. On March 28, 2014 at the United Nations Human Rights Council a resolution for “The promotion and protection of human rights in the context of peaceful protests, tried to safeguard this right” passed but with the narrow defeat of amendments that would have watered it down led by South Africa with the backing of Algeria, Belarus, China, Cuba, Egypt, Ethiopia, Russia, Saudi Arabia and Venezuela. Out of that list of countries the one with the closest relationship with South Africa is Cuba. Incidentally in the present crisis in Ukraine it is North Korea, Syria, and Cuba backing the Russian incursion into Crimea. UN experts in the past justified the presence of outlaw regimes such as Cuba and North Korea in the UN Human Rights Council arguing that it would temper their behavior. Looking at the Cuban dictatorship’s track record and its successful undermining of international human rights standards one hopes that these experts will re-examine their assumptions.